Nostalghia is a 1983 Soviet/Italian film, directed by Andrei Tarkovsky and starring Oleg Yankovsky, Domiziana Giordano and Erland Josephson. Tarkovsky co-wrote the screenplay with Tonino Guerra. Antonio "Tonino" Guerrawas an Italian poet, writer and screenwriter who collaborated with some of the most prominent film directors of the world, such as Michelangelo Antonioni, with L'avventura, La notte, L'Eclisse and other films. 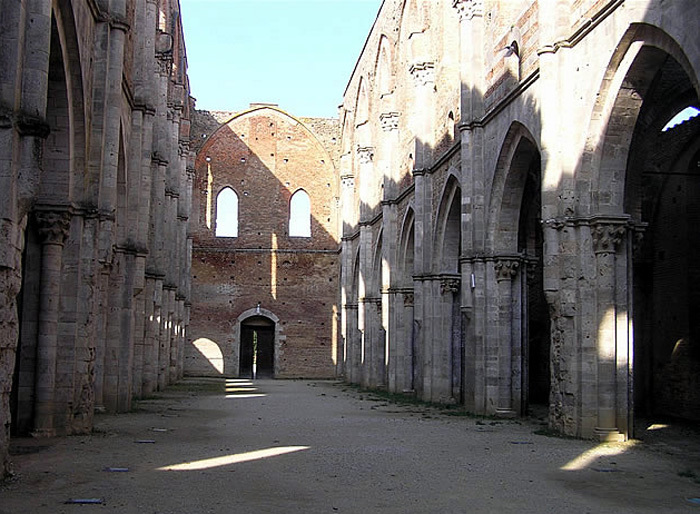 Several scenes of the film were set in the countryside of Tuscany and northern Lazio; as the Abbey of San Galgano, the spas of Bagno Vignoni, the Orcia Valley, in the Province of Siena, the mysterious crypt of Abbadia San Salvatore on the Mount Amiata and the drowned church of Santa Maria in San Vittorino of Cittaducale, in the Province of Rieti. La piazza del Campidoglio a Roma è un luogo magico: Tarkovskij vi gira una scena di rara potenza. Dalla statua di Marc’Aurelio in Piazza del Campidoglio, Domenico denuncia l’idiozia umana, la perdita di spiritualità, l’indifferenza e l’inclinazione alla rovina, il ripudio dei veri maestri e la perdita di valori interiori. The Russian writer Andrei Gorchakov (Oleg Yankovsky) travels to Italy to research the life of 18th-century Russian composer Pavel Sosnovsky, who lived there and committed suicide after his return to Russia. He and his comely interpreter Eugenia travel to a convent in the Tuscan countryside, to look at frescoes by Piero della Francesca. Andrei decides at the last minute that he does not want to enter. Back at their hotel Andrei feels displaced and longs to go back to Russia, but unnamed circumstances seem to get in the way. Eugenia is smitten with Andrei and is offended that he will not sleep with her, claiming that she has a better boyfriend waiting for her. Andrei meets and befriends a strange man named Domenico (Erland Josephson), who is famous in the village for trying to cross through the waters of a mineral pool with a lit candle. He claims that when finally achieving it, he will save the world. They both share a feeling of alienation from their surroundings. Andrei later learns that Domenico used to live in a lunatic asylum until the post-fascistic state closed them and now lives in the street. He also learns that Domenico had a family and was obsessed in keeping them inside his house in order to save them from the end of the world, until they were freed by the local police after seven years. Before leaving, Domenico gives Andrei his candle and asks him if he will cross the waters for him with the flame. During a dream-like sequence, Andrei sees himself as Domenico and has visions of his wife, Eugenia and the Madonna as being all one and the same. Andrei seems to cut his research short and plans to leave for Russia, until he gets a call from Eugenia, who wishes to say goodbye and tell him that she met Domenico in Rome by chance and that he asked if Andrei has walked across the pool himself as he promised. Andrei says he has, although that is not true. Eugenia is with her boyfriend, but he seems uninterested in her and appears to be involved in dubious business affairs. Later, Domenico delivers a speech in the city about the need of mankind of being true brothers and sisters and to return to a simpler way of life. Finally, he plays the fourth movement of Beethoven's Ninth and immolates himself. Meanwhile, Andrei returns to the mineral pool to fulfill his promise, only to find that the pool has been drained. He enters the empty pool and repeatedly attempts to walk from one end to the other without letting the candle extinguish. As he finally achieves his goal, he collapses. This was Andrei Tarkovsky's first film directed outside of the U.S.S.R. It was to be filmed in Italy with the support of Mosfilm, with most of the dialogue in Italian. 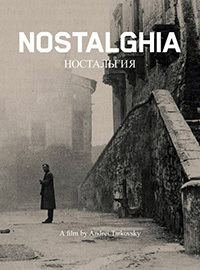 When Mosfilm support was withdrawn, Tarkovsky used part of the budget provided by Italian State Television and French film company Gaumont to complete the film in Italy and cut some Russian scenes from the script, while recreating Russian locations for other scenes in Italy. Andrei Tarkovsky's brooding late masterpiece and a darkly poetic vision of exile was the first of his features to be made outside of Russia, the home to which he would never return. This love and melancholy is embodied in the film by Andrei (Oleg Yankovsky, The Mirror), a Russian intellectual doing research in Italy. Written with frequent Michelangelo Antonioni collaborator Tonino Guerra (L'Avventura), Nostalghia is a mystical and mysterious collision of East and West, shot with the tactile beauty that only Tarkovsky can provide. Andreij Tarkovsky replaced the original fresco in the Basilica di San Pietro with the Piero della Francesca Madonna del Parto. Alcune scene del film Nostalghia, girate nella chiesa di S. Vittorino a Cittaducale.. La chiesa a San Vittorino sommersa nell’acqua. Sotto la chiesa c’è una sorgente naturale e dal pavimento esce acqua che, secondo la tradizione popolare, è miracolosa. Discurso de Domenico na piazza del Campidoglio, Roma. A piazza del Campidoglio, l'amico "pazzo" del protagonista, Domenico, parla alla gente dalla statua equestre del Marco Aurelio e si toglie la vita, in nome di un ritorno alla semplicità ormai perduta nella vita moderna. The film won the Prize of the Ecumenical Jury, the prize for best director and the FIPRESCI Prize at the 1983 Cannes Film Festival. Tarkovsky also shared a special prize called Grand Prix du cinéma de creation with Robert Bresson. Soviet authorities prevented the film from winning the Palme d'Or, a fact that hardened Tarkovsky's resolve to never work in the Soviet Union again. Tonino Guerra worked with such filmmakers as Michelangelo Antonioni, with L'avventura, La notte, L'Eclisse, The Red Desert, Blowup, Zabriskie Point and Identification of a Woman, Federico Fellini with Amarcord, Theo Angelopoulos, with Landscapes in the Mist, Eternity and a Day and Trilogy: The Weeping Meadow, Andrei Tarkovsky with Nostalghia, and Francesco Rosi, with The Mattei Affair, Lucky Luciano and Exquisite Corpses. This article incorporates material from the Wikipedia article Nostalghia published under the GNU Free Documentation License. Bagno Vignoni was the location in which the majority of Andrei Tarkovsky's 1983 film Nostalghia were shot. Bagno San Filippo was the location in which parts of Alice Rohrwacher's 2014 film Le Meraviglie were shot. 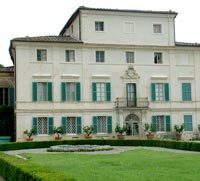 Villa di Geggiano è stato scelto nel corso degli anni per molte produzioni televisive e cinematografiche. Tra i più famosi utilizzo della Villa è stato per Io ballo da sola di Bernardo Bertolucci.